Back in 2003, a casual bird’s eye view shooter game came out called Crimson. It was super casual and super fun and super addictive. You played a man stranded alone in an alien planet, usually starting off with just a pistol. And as bugs and aliens swarmed from all directions, you start picking up items and power ups and get skills as you level up. Fun as that was, the game had a few other modes like Survival. One of the modes was called typ’o’shooter. In this mode, whatever monsters come out at you from the edge of the screen would have a word above them. Typing the word and pressing enter is how you kill them. It becomes harder as it progresses on of course. Another game came out recently called The Typing of the Dead (review incoming). As opposed to type shooting being a mode, it’s the way to play the game. This was actually an arcade game back in the day, but has resurfaced with iOS remakes and the Windows version Typing of the Dead: Overkill on October 2013. I was just chilling on my phone when I had the sudden urge to play a game like that. A type shooter game. I didn’t have Crimsonland on me, nor Typing of the Dead. I figured I’d see if there was a game like that on the Android. And what do you know, there was! 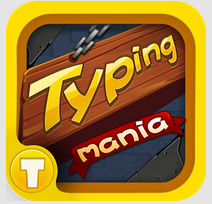 A few results came up when I searched ‘typing game’ and Typing Mania looked to be the most promising. Some of the user reviews were not the best rated but I decided to give it a try anyway – I had time to kill. I ran the appruin theand was surprised by how fast it booted (also surprised by how easily I am impressed). 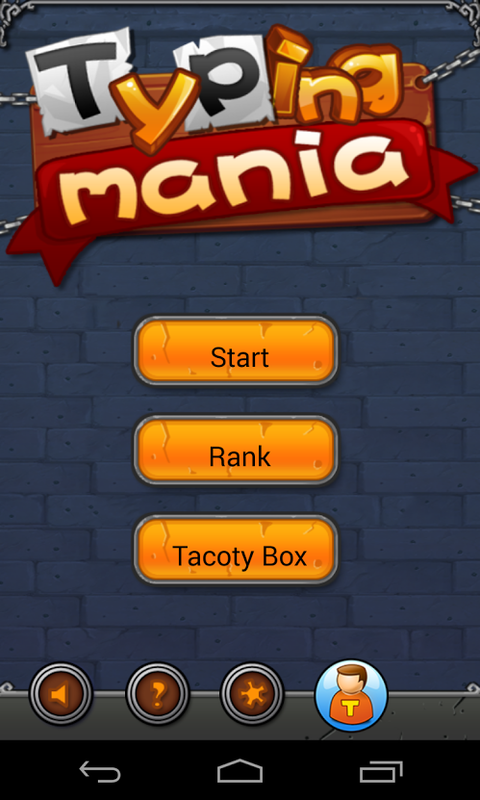 The menu was a simple Start, Rank and something called Tacoty Box. An ad pops up the bottom and instantly I’m a little turned off from the game. Most of them these ads are so intrusive and ruin the look of the game – this one was no different hanging low at the bottom actually partially covering some of the buttons. I thought, “Meh.” and pressed Start. A brief simple tutorial shows what to do, i.e., typing the word to get rid of it as it drops down the screen. Bombs and 2x powerups are available randomly, and can be used by tapping on them on the side of the screen. And once again the ad is really visible, a stark contrast to the rest of the app, this time sitting at the top. 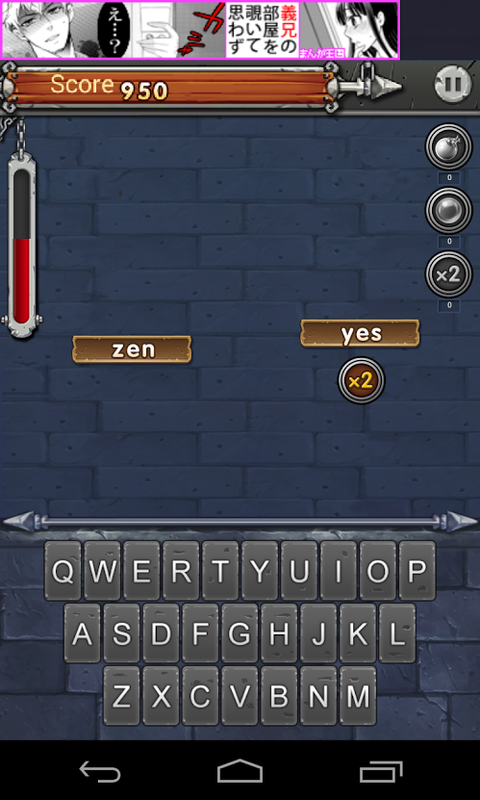 One of the first things you notice is that the game uses its own keyboard, with a stone texture on it. And the second thing you notice is that it does not fill the full width of the screen but leaves enough on both sides to stick two more keys on the layout. What does this mean? It means that they keys are much more squeezed than they needed to be. And what does that mean? It means that you miss letters very often. If you begin to a type a word you have to finish that a before you move on to a new word. I’m pretty darn good at typing on a touchscreen, so it was kind of annoying that I couldn’t finish typing “still” even though I got the first l. Goes to show how good the in-game keyboard is. It would have been so much better if they had the android keyboard on it instead. Easier words and syllables move into slightly bigger words and in greater numbers as you keep playing. I thought it would end at one point but it seems like it’s a survival thing and it’s only over when you run out of health (a bar on the left) which holds out for maybe four or five missed words. Missing letters of a word makes it drop down faster and making too many mistakes on the same word makes it drop super fast. I was disappointed to get bored of it so fast, though. Barely five minutes in and I was pretty much hoping I’d miss the words so that I could be done. Did I mention that every time you get a word right, the game plays a catcall whistle? That got old after the first time and I had to mute it because I couldn’t find a ‘Sound/Music’ button on the screen. It has a lot of potential simply on account of the genre and the fact that there aren’t that many of these games, to my knowledge at least. But very poor and cheesy execution (catcall, really?) actually made it an annoying game to play. I’ll still be on the look out for a type shooter game. On a good note, Crimsonland has been greenlit for Steam, so that’s exciting.